The 2012 NFL Draft class of quarterbacks has already been drawing comparisons to the 1983 class that produced future Hall of Famers John Elway, Jim Kelly and, of course, Dan Marino. The comparisons came with good reason a year ago as Andrew Luck guided the Indianapolis Colts to an 11-win season after just a 2-14 finish the year before. Robert Griffin III delivered the Washington Redskins their first division title since 1999 while Russell Wilson, although not a first round pick, helped bring an 11-5 campaign and a playoff appearance to Seattle. A largely forgotten man in that draft class was eighth overall pick Ryan Tannehill. 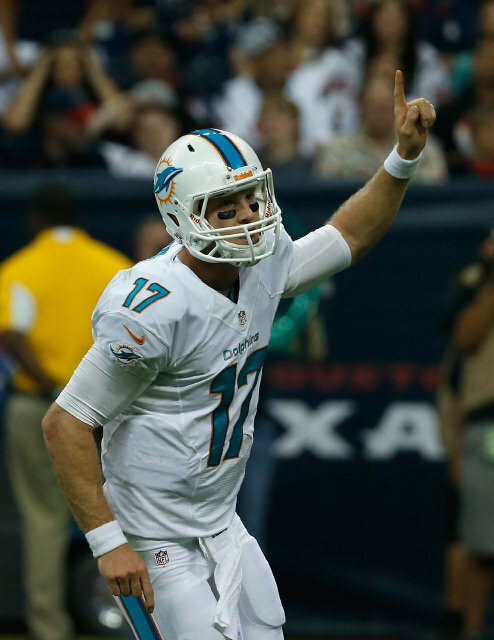 Tannehill, a former receiver at Texas A&M, was taken by the Miami Dolphins and led Miami to a 7-9 season as a rookie. Through two games in 2013 however, Tannehill is being overlooked no more. The second-year man has led his team to victories over two of his counterparts from the 2012 draft, Luck and Cleveland's Brandon Weeden. Most would agree that Tannehill is not yet as accomplished in his young career as Griffin, Luck or Wilson, but through two games this season, Tannehill has his team 2-0. Wilson's Seahawks also are 2-0, but every other quarterback taken from the 2012 draft class has at least one loss while Griffin's Redskins and Weeden's Browns are each 0-2. Head-to-head against other members of that class, Tannehill has the best record as a starter at 3-1. While Russell Wilson is leading a team in Seattle that many believe are destined to appear in the Super Bowl, his numbers this season in terms of passing yards and completion percentage are behind Tannehill's. The two each have two touchdown tosses on the young season and each has one interception. Wilson has won seven straight regular season games as Seattle's starter, but his last loss came to Tannehill in Miami last November as Tannehill rallied Miami for a 24-21 victory. But while Wilson and the Seahawks were impressive in a 29-3 victory over San Francisco on Sunday night, Tannehill became just the second visiting quarterback to win in Indianapolis in 12 tries. Both of Miami's wins this season have come on the road and both with the Dolphins trailing in the second half. While the Dolphins are 2-0 on the road in 2013, the rest of the league is a dismal 9-21 away from home. As far as the Dolphins' quarterback goes, Tannehill is winning games in the second half as opposed to last season when his biggest task was not to lose them. Without a running game in Week 1, Tannehill led the Dolphins on two touchdown drives in the second half including a 10-play, 85-yard march in the fourth quarter that all but put Cleveland away. Last week, Tannehill drove Miami for its only touchdown of the second half with just under five minutes to play in the third quarter. But in the final quarter, Tannehill converted enough third downs in the second half to keep Luck and the high-powered Indianapolis passing attack off the field. While big things have come to be expected out of 2012 draftees Andrew Luck, Robert Griffin III and Russell Wilson, Miami's Ryan Tannehill is making up ground on his draft class in a hurry. Tannehill is averaging just under 300 yards-per-game passing through two weeks and is making plays when his team needs him the most. Tannehill is also 10th in the league in terms of completion percentage thus far, tops among quarterbacks taken in the 2012 NFL Draft. Making that statistic more impressive is the fact that Tannehill has done so while ranking eighth in the NFL in yards-per-attempt. Luck, Griffin and Wilson all appear well on their ways to long successful careers, but the stellar quarterback class of 2012 has just gotten deeper. Since the retirement of Dan Marino following the 1999 season, the Miami Dolphins have been perpetually searching for a franchise quarterback. If the first two weeks of the 2013 season are any indication as to how good Ryan Tannehill can be, Miami fans should be very optimistic that their franchise quarterback has arrived. The Miami Dolphins In or Out?